It’s time to publicly announce my new work-in-progress, a video game about being the Editor in Chief of a small but highly ambitious newspaper. Start out as a small, failing rag, and build a media power house! The gameplay is about growing a staff of great reporters (keeping them happy and matching them with the right stories), shaping the paper and growing those subscriber numbers, while working under a mysterious Owner and the whims of the Advertisers. This is part 3 of my article series about translating video games. Part 1 gave you a high level overview of the process, and things to consider when translating a game. Part 2 talked about splitting up the content and handing it back and forth, plus tools for getting it done. In this final act I talk implementing it all, using a Gamemaker Studio 2 project as an example (download link below). Note however, that using this approach can be done with any engine. With a few changes, you could adapt a similar solution using XML-files with C#, instead of ini-files and GML. Open the example project to get a better idea of how all the elements fit together. Note that the free version of Gamemaker Studio 2 does not support included files. 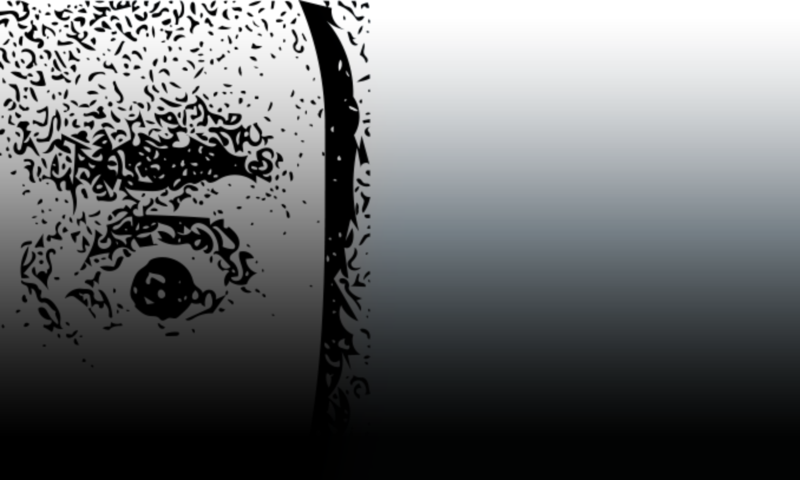 For the record, yours truly has no official affiliation with YoYo Games or Gamemaker. I use Gamemaker in this article, because that is the engine I used for Torgar’s Quest. As a final disclaimer, while these scripts are all fairly simple, I do not explain any basic concepts like if/else-statements. DOWNLOAD EXAMPLE PROJECT FILE: LocTut.zip – You will need to unzip it, before you can open it in Gamemaker Studio. If you want to generate a set of ini-files that go with the example project, you can use the spreadsheet provided in part 2. It already contains the needed data and a macro that spits out an ini-file for both languages in that project. Next, make sure you have imported all relevant special characters for each language. From umlauts to caron characters, fonts are not always imported with these by default, or may not even include them at all. The reasoning is that fonts take up memory, so any unneeded character that is excluded equals memory saved and performance gained. This especially true with alphabets containing many characters, such as Chinese. Identify exactly which special characters are needed for your translations, and add them to the game. For Torgar’s Quest, I asked each translator to provide a list of special characters (since they know their language better than me), and trusted that they did not miss one. And when it happened anyway, it was still caught in QA and fixed in a couple of minutes. If a font used in the project does not include the characters you need, you may have to use a different font altogether. At that point you will have to decide whether to change that font game-wide or just for this one language. Game-wide changes can affect the overall look and feel of the game, and language specific changes can result in a mess of exceptions, as different languages have their own issues. This is a common example of a translation related problem that appears late in the development or QA phase of a project, and may require last minute design compromises. Match the folder structure in your project with the one on your drive to avoid unnecessary confusion. Little consistencies like that make a big difference in keeping things organized as your project scales. When the game launches, it loads the default settings. In our example, the default is English. Next, the strings are loaded into a ds_map called global.text (if you are unfamiliar with GML, a ds_map is the equivalent of a Dictionary/Hashmap in other languages). Since I only have a small amount of data, I just add it directly. If you don’t have a ton of text, this is fine. If you have a lot of data, you may want to make a loop of some kind instead. This script is only executed on launch. // Copy data from the ini to the map. Normally, I would put this code in a persistent controller object, but for the sake of simplicity, in the example project the button itself runs the code to set things up as well as switching the language, which comes next. The current language reference code is stored in a simple, global string. To change the language, we call a script called s_setLoc() and provide the language code, we want to switch to, as an argument. /// Sets the active language. 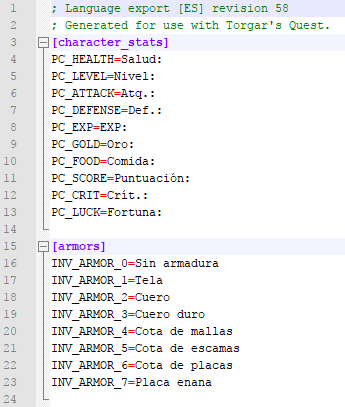 // Opens the ini file matching the language. As you can see, changing the language is very similar to the initial setup. The strings are loaded into memory to avoid opening the ini-file every time a string is displayed. Continual loading of a file would slow down your game’s performance on lower end systems, and it’s just not a good approach. Loading from memory is faster and more efficient. 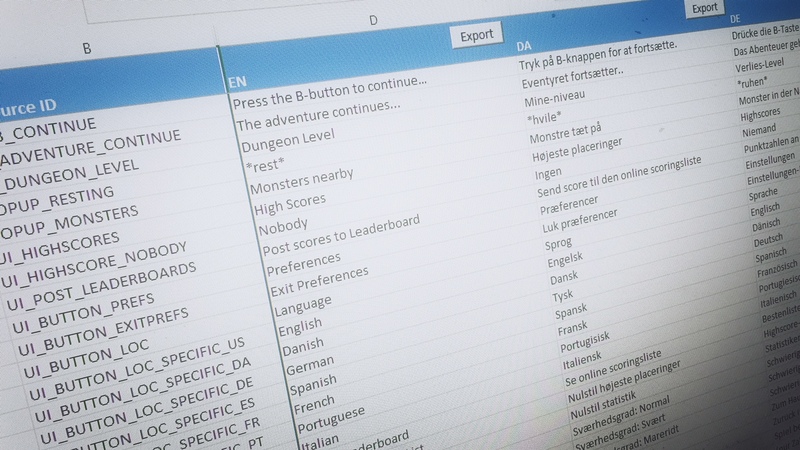 If you have tons of text, you may have to expand on this to support several sources instead of just one ini-file per language, and then only load what is needed for the section of the game that is running. Once the language is set and the assets are loaded, you call another script to show the specific string. That script takes the string ID as its parameter, then matches the ID with the keys of the string map in memory, and spits out the matching value. This script doesn’t care what your language setting is, it strictly matches an ID with whatever is in that slot in the map. If there is no translation for a string at all, or the ID was mistyped, the ID itself will be displayed in-game. 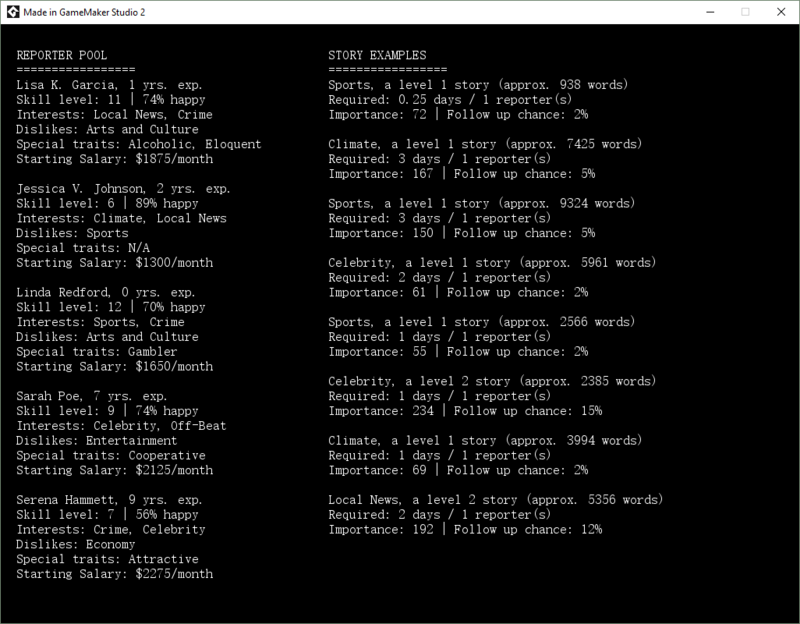 This helps with debugging, making it very easy to see, what still needs to be translated. 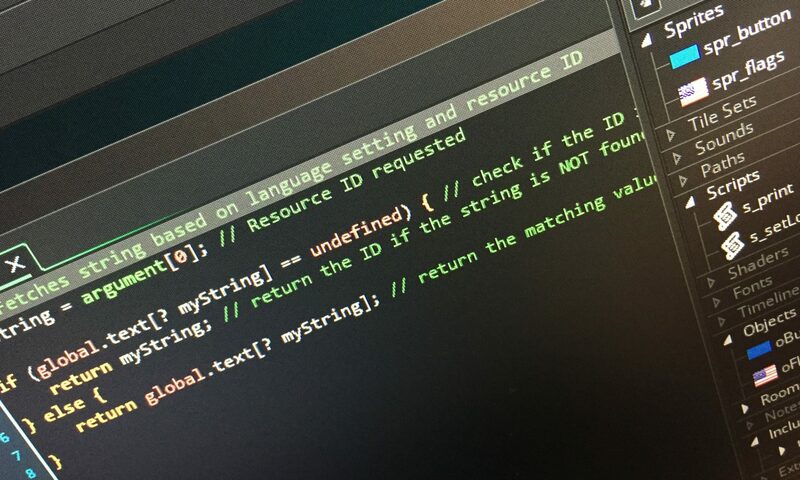 // If the string does not exist, return the ID as a string. // Otherwise return the string value matching the ID. You are using the most current assets. Are you using the right version of Gamemaker Studio? Your ini-files are utf-8 formatted, which is what Gamemaker expects. You can check this (and convert if necessary) from most text editors. You have included all necessary special characters in your font set. Translation is so much more than switching one language out with another, both in terms of content considerations and technical challenges. I hope these three articles have helped shed some light on what is actually involved, what most of the dangers are, and how some of them can be averted. I don’t claim to have all the answers, in part because I believe every project is unique and will come with its own set of challenges. I guess you can boil it down to this: successful translation of a video game is the sum of good source material, careful scope consideration and properly equipped translators, held together by a streamlined workflow. It may be rare to see those factors all come together perfectly, but aiming for the best is always a good starting point. If I missed anything, please do share it, drop a comment or reach out to me on twitter (@theprint).